You call, and they sing. Since 1960, University of Illinois students have sung Christmas carols over the phone, live from Snyder Hall. And your family can join the roster of callers when the Dial-A-Carol line re-opens at 12:00 a.m. on Thursday, Dec. 13 and continues through 11:59 p.m. on Wednesday, Dec. 19. If your kids love calling someone on the phone, don’t miss it. Not only do little kids love it, but the college students love talking to little kids. This will be Dial-A-Carol’s 58th season of delivering holiday cheer over the phone lines (call (217) 332-1882). Step 2: A recording will answer. It says you might have to wait up to 15 minutes, but we’ve never waited that long. Be prepared to answer a few questions – your name, where you are calling from, and what song you would like. They might also ask where you heard about it – answer chambanamoms.com! Step 3: Once you hear a live human, politely ask for your favorite holiday song. People can request any Christmas carol they want. Want to find the most obscure of songs? Go ahead and try to stump them – although they are whizzes at Google. Step 4: Listen to the song. Sing along if you wish! Step 5: Call again. You can call as much as you want. Every time they get a request for “All I Want for Christmas Is You” by Mariah Carey, they track it via the “Mariah Meter”. In 2016, they sang that song more than 300 times. Dial-A-Carol has transcended technology, but continues to embrace it as well. Last year, they added a new wrinkle by doing Request-a-Song on Facebook Live (see its Facebook page). This year, they’re focusing social media efforts on Instagram. Dial-A-Carol fielded more than 10,000 calls during the 2016 season. All 50 states were covered within the first 24 hours of the event, and calls were received from 75 countries. Callers include children and adults of all ages including community members, university students, faculty members, and alumni. The program is fully staffed by volunteers. Students pulling all-nighters isn’t uncommon during finals, after all. Just to remind you, the telephone number during the week is (217) 332-1882. 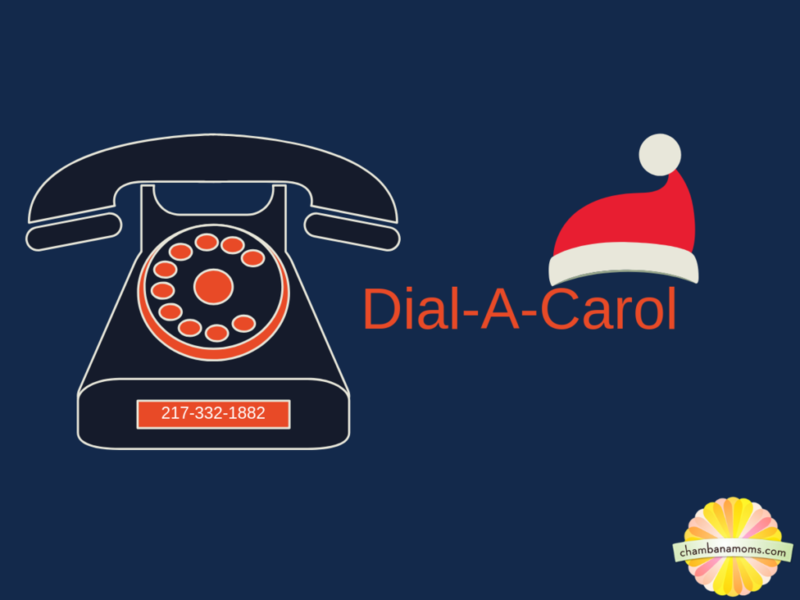 You can learn more about Dial-A-Carol via Facebook, Twitter (@DialACarol), and Instagram.